Battery powered portable tracking. We have the power! Long-life battery powered tracking is now affordable and necessary to keep tabs on your assets. You can see what's happening 24/7 to anything you choose to track with the BOX solo battery powered tracker. No wiring and easy installation with up to three years battery tracking! Track trailers, caravans, boats, motorcycles and plant. 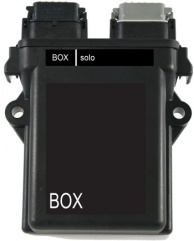 Box solo costs just £299. Monthly service £10. Lease it for £10.26 monthly (36 month lease, min value £1000) + vat.